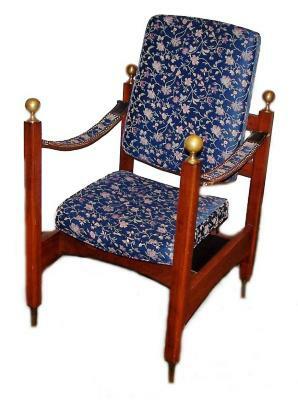 Wooden framed chairs. The arms are decorated with solid brass finials at the front and on the back wooden supports. Contemporary upholstery has replaced the original black leather. These pulpit chairs provided seating for the officiants on the temple bimah of the third building constructed by the congregation; they were used at Temple located on Reading Road at North Crescent, North Avondale, Cincinnati. In 1840 the Isaac M. Wise Temple was founded (as K.K. Bene Yeshurun) by a group of young German Jews who were not in sympathy with the previously established English congregation in Cincinnati, K.K. Bene Israel (Rockdale Temple). K.K. Bene Yeshurun was renamed in the twentieth century in memory of Rabbi Isaac M. Wise who served as its rabbi for almost fifty years, and who played such a major role in the establishment of American Reform Judaism.